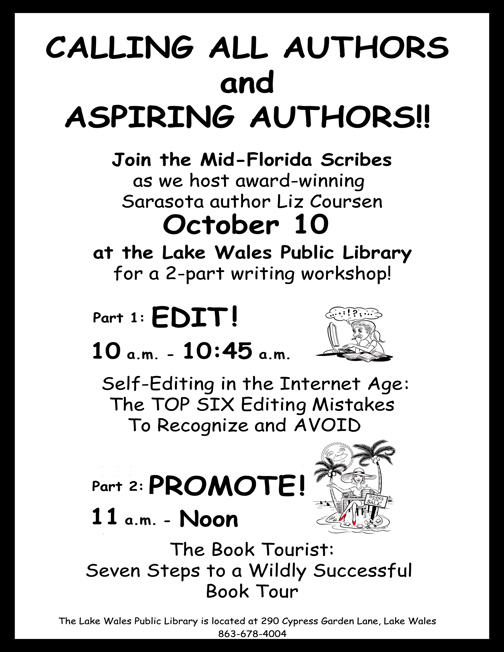 The Mid-Florida Scribes are pleased to announce that award-winning Sarasota author and editor Liz Coursen will present a two-part workshop for authors and aspiring authors on Saturday, October 10, at the Lake Wales Public Library. The first program, "Self-Editing in the Internet Age," will introduce participants to what Coursen feels are the "top six" editing mistakes that she sees people make, in books, in blogs, in bios. "It's difficult to take someone seriously when you read his or her writing and find typos and other mistakes," says Coursen. "Fortunately, editing is fun and easy, once you know some basic rules. In fact, I enjoy editing so much that I blog about it at EditNation.com." Coursen's second program, "The Book Tourist: Seven Steps to a Wildly Successful Book Tour," is all about promotion. "I'm a nine-time author," Coursen says. "I speak about my books on average 80-100 times a year, and I love to share my hard-won knowledge with other authors. All authors, whether traditionally published or self-published, need to recognize one simple fact: it's all up to you. You have to take your book promotion into your own two little hands, and an effective, efficient book tour is a great way to spread the good news about your book." The Lake Wales Public Library is located at 290 Cypress Garden Lane, Lake Wales. The programs are free, there is plenty of parking, and everyone is welcome.